Matthew R. Groenewold, PhD, MSPH, NREMT, was named the 2016 SPHIS Alumni Fellow for his extraordinary professional accomplishments and commitment to the school. Watch a video about Dr. Groenwold's recognition as alumni fellow. Attend the Alumni of the Year luncheon on March 8, 2017. Dr. Groenewold is a three-time graduate of SPHIS, earning his PhD in Public Health Sciences with a specialization in Epidemiology in 2008 and a Master of Science in Public Health in Epidemiology in 2002. He also completed a certificate in Clinical Investigation Sciences in 2002. Dr. Groenewold received a Bachelor of Arts in Biology from Indiana University Southeast in 1997. 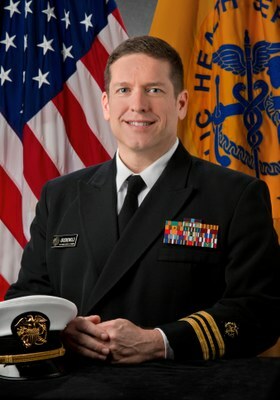 Dr. Groenewold is an epidemiologist and a Lieutenant Commander in the Commissioned Corps of the United States Public Health Service assigned to the Centers for Disease Control and Prevention (CDC) National Institute for Occupational Safety and Health (NIOSH), where he conducts occupational health research and surveillance. Dr. Groenewold is also a response leader on CDC’s newly formed Global Rapid Response Team. In Oct. 2016, he begins a deployment for CDC's Zika virus response and will be working at the Emergency Operation Center (EOC) in Atlanta. In 2015, he was deployed to Sierra Leone to support the international response to the West Africa Ebola epidemic. He was assigned to the rural Kambia District where he performed Ebola surveillance and case investigation. He also coordinated the training of Republic of Sierra Leone Armed Forces soldiers deployed along the border with Forrecaria, Guinea to conduct Ebola screening at border crossing points. Dr. Groenewold was also deployed for the 2010 Deepwater Horizon oil spill response and participated in the CDC’s domestic response to the 2009 influenza pandemic. Prior to his current assignment, Dr. Groenewold served as a CDC Career Epidemiology Field Officer assigned to the Kentucky Department for Public Health where he provided epidemiological and general public health expertise and leadership and led outbreak investigations in community and healthcare settings. He began his USPHS and CDC careers in 2008 as an Epidemic Intelligence Service Officer assigned to NIOSH. Dr. Groenewold began his public health career in 1998 at the Jefferson County Health Department, now the Louisville Metro Department of Public Health and Wellness, where he worked in various positions over ten years including environmental health specialist/sanitarian, health education specialist and epidemiologist. Prior to that, he worked in Emergency Medical Services for seven years as an EMT, Advanced EMT and Paramedic. Dr. Groenewold is a veteran of the United States Coast Guard (1988-1992). In 1991, he was deployed to the Middle East during Operation Desert Storm and was awarded the Navy Achievement Medal for his service. Dr. Groenewold has authored or coauthored numerous peer-reviewed journal articles and national conference presentations and a government publication. Dr. Groenewold’s wife, Melissa, earned her Masters of Arts in Spanish from the University of Louisville, where she is currently on the faculty of the Department of Classical and Modern Languages and coordinates the Basic Spanish Program.